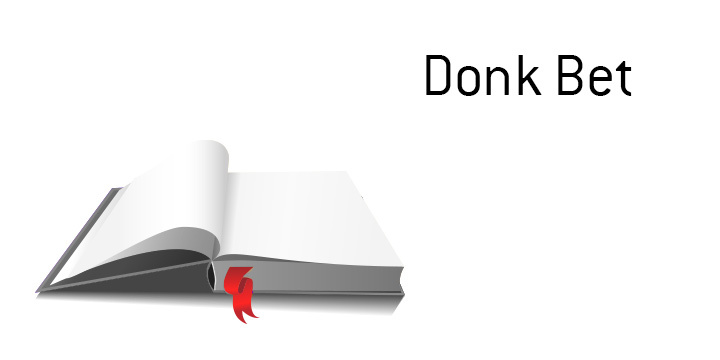 What does the term "donk bet" mean in the world of poker? What is the definition of the term "donk bet"? In poker, a "donk bet" is a post-flop bet that doesn't seem to make much sense. For instance, let's say that there is a pre-flop raiser that is called by two people. After the flop, a player at the table that is out of position decides to bet half the pot. Instead of waiting for the person in position (who also raised pre-flop) to place a continuation bet (which any decent player is going to do most of the time), this out of position player puts out an odd wager. This is also called a "donk bet". "Donk bets" are usually placed by players who are not that good (which is why it is called a "donk bet") and usually indicates that they are holding a very strong hand. In the scenario listed above, both of the other players that are involved in the hand will slow up tremendously, as they will be sure that the donk betting player has flopped a huge hand. A decent player, on the other hand, is almost certainly going to let the pre-flop raiser put in a continuation bet in order to continue to build the pot if they flopped a big hand, whereas the "donk bettor" will likely scare people off. It is always important to consider things like position and which players were aggressive pre-flop when deciding how to play your hand after the flop, especially if you are out of position. In the case listed above, the "donk bettor" has almost certainly minimized the amount of money that they will be able to make on the hand.